In early 1971, LRB was 22 and a very confident young man. He had already spent 3.5 years at Hindustan Lever Ltd. and his career had progressed rapidly. His company 'rated him very highly' and, 9 months ago, had promoted him (over some of his seniors) to a specially created position of Marketing Research Manager, to lead a team of market researchers in the Management Services Group. There was a plan to send him to the UK (as HLL Listers typically are) for 2 years, to gain some experience at the headquarters of Unilever and Research Bureau Ltd. so that he could return and take over the leadership of the Management Services Group from his immediate boss, Mr. Robert Tofts. But, by this time, LRB was already set on moving to the world of research and academics and joining a Ph.D. programme. As he said in a later interview, he would probably have stayed at HLL for another 2-3 years, but the plan to send him abroad led him to advance his resignation. If he had gone to the UK, he would have been morally obliged to return and work for some more years. Therefore, LRB made haste to put together applications to PhD programs at the management schools of leading American universities with an aim of starting in the Fall of 1971. That year, we know that he applied to the Wharton School of Business, University of Pennsylvania, who made him an offer in March, 1971. Amongst his papers, we found some of his application materials. 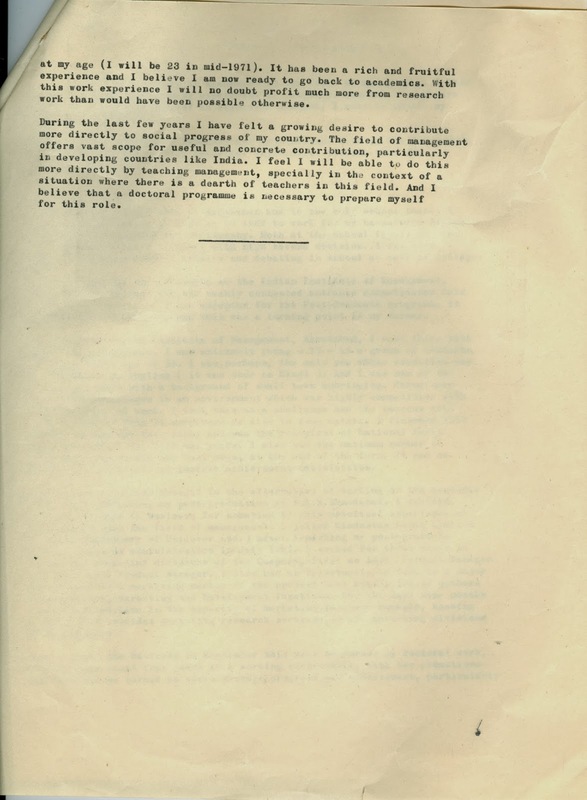 A typewritten Statement of Purpose and a letter of recommendation from his former boss. The Statement presents his candidature and is a very useful historical document, for it includes a biographical statement and his motivations. The reveal an LRB who is confident and clear of his goals. I have decided on a career in academics in the field of management. I have nearly four years of working experience in industry. However, to prepare myself fully for the role of an effective teacher, I need to pursue my studies for a Ph.D. The doctoral programme in Business and Applied Economics at the University of Pennsylvania provides an excellent opportunity towards this end. I was born in a small town in Rajasthan and (went) to the only school there. I joined the University of Jodhpur in 1962 to work for my bachelor's degree in arts with Economics and Philosophy. Both at the school finals and the degree examinations I finished with high second division. I was very active in student council affairs and debating in school as well as college. In 1965 I applied for admission to the Indian Institute of Management, Ahmedabad and sat for the keenly contested entrance competitions held at the national level. I was accepted for the Post-Graduate Programme in Business Administration, and this was a turning point in my career. When I joined the Indian Institute of Management, Ahmedabad, I went there with three major handicaps. I was extremely young - 17 - in a group of students with an average age of 24. I was, perhaps, the only one whose education was not conducted in English (it was done in Hindi). And I was one of the few people there with a background of small town upbringing. These were serious disadvantages in an environment which was highly competitive with heavy pressure of work. I took this as a challenge and the success with which I emerged from it surprised me also to some extent. I finished with a place in the top five ranks and was the recipient of the National Merit Scholarship award for both the years. I also had the maximum number of job offers, including the best ones, at the end of the term. It was an achievement which gave me immense achievement satisfaction. I had given a serious thought to the alternative of working in the academic field after finishing my post-graduation at IIM, Ahmedabad. I decided, however, to work in business for some time to gain practical experience of and insight into the field of management. I joined Hindustan Lever Ltd. (Indian subsidiary of Unilever Ltd.) after finishing my post-graduate work in business administration in July 1967. I worked for three years in one of the marketing divisions of the company, first as Assistant Product Manager and later as a Product Manager. I also had an opportunity to work on a major new product as a marketing member of the project team consisting of members from Research, Marketing and Development function. For the last nine months I have been working in the capacity of Marketing Research Manager, heading a group that provides marketing research services to all marketing divisions of the company. When I leave the business in September this year to pursue my doctoral work, I would have spent four years in a working environment, with two promotions and what can be termed an above average progress and achievement, particularly at my age (I will be 23 in mid-1971). It has been a rich and fruitful experience and I believe I am now ready to go back to academics. With this work experience I will no doubt profit much more from research work than would have been possible otherwise. During the last few years I have felt a growing desire to contribute more directly in social progress of my country. The field of management offers vast scope for useful and concrete contributions, particularly in developing countries like India. I feel I will be able to do this more directly by teaching management, specially in the context of the situation where there is a dearth of teachers in this field. And I believe a doctoral programme is necessary to prepare myself for this role. He also asked for recommendation letters from three people. Prof. SK Bhattacharya at IIM, Ahmedabad who was (and would remain in the years to come) his mentor, Mr. BA Vatsal, his previous boss at Hindustan Lever Ltd. and Prof. KK Anand. All three individuals are no longer alive. And, only one letter, from Mr. Vatsal survives. It is reproduced below. 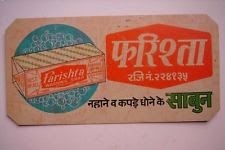 In the letter, Mr. Vatsal mentions a 'major new brand project' which was, very likely, a detergent version of Lux Flakes. Mr. Vatsal also mentions two deaths in LRB's family in the period that he has known him - one of these was his younger sister, Kusum, who died of Leukemia in 1969. Mr. B. A. Vatsal himself passed away at a young age, on the 7th of January, 1975 in Madras. I am in business, not at University. As such, it may be useful for the reader to know my credentials for evaluating Labdhi's fitness for graduate study and research. I am a graduate of Bombay University (First class honours). I went to Stanford University, California on a scholarship and got my A.M. from there, earning a grade point average of 3.8 out of a possible 4 for my coursework there. I have been working with Hindustan Lever since my return from the States in 1963. I now head the Sales function of one of the marketing divisions of the company. I have known Labdhi since he joined the firm. We worked together for over two years. Common interests - books and world of ideas - continue to throw us together frequently. Labdhi is a very unusual young man in many ways. Perhaps the most unusual thing about him is his maturity - emotional and intellectual - which far above that of his peers in the organisation. He demonstrated his emotional maturity in the calm with which he faced up to two deaths in his immediate family, sudden and successive. He has unusual intellectual ability as I have seen in the results he produced on a major new brand project. Apart from being the brand manager in-charge, he had to work on this project as a member of a REsearch-Marketing-Development team, whose other members were much older than he., in age and experience. I regard the results produced by that team as a characteristic of Labdhis ability to win people over to his point of view. Even the most intelligent young Indians of Labdhi's background - tradition-oriented family, orthodox community, and small town upbringing - tend to have excessive respect for authority. Not so Labdhi. He has a clear, logical mind and brings a healthy sceptical eye to bear on all problems he encounters. Again, for someone whose education in English began relatively late, he speaks and writes the language with as much facility as Indians trained in English from birth. I have no hesitation in recommending Labdhi highly for graduate work in Management. He is a very intelligent and ambitious young man who will not settle for second best in anything he undertakes. Nor does he compromise on integrity in his pursuit of achievement. He is, I think, at about just the right stage to gain from a return to academics - not too far removed from his earlier University work, at the same time considerably more hard-nosed than when he left the University, with rich and fruitful experience. I forecast that he will make a stimulating teacher and contribute significantly to the body of knowledge on management, especially on problems peculiar to developing countries. 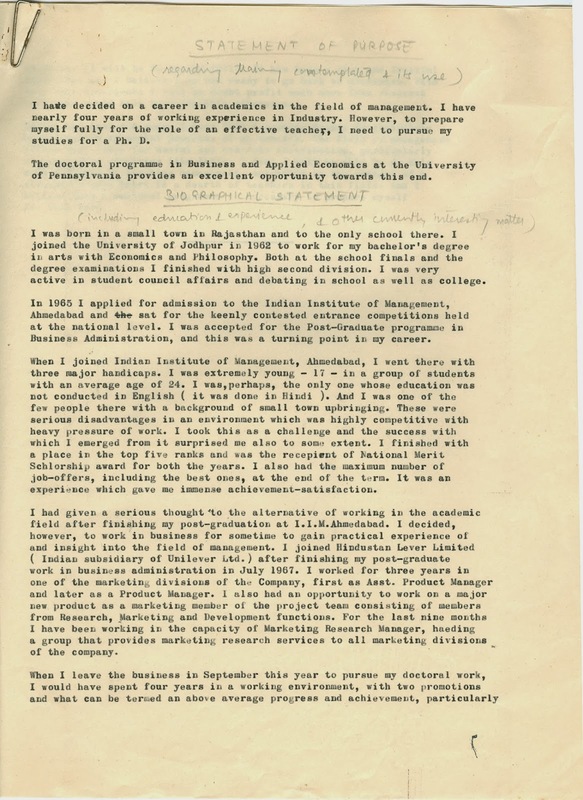 General Sales Manager, Hindustan Lever Ltd.
LRB was offered a place by Wharton in March, 1971. Now, it fell upon him to arrange for funding for the program me in the next six months, which he set out to do in earnest. Amongst his papers, we found a number of letters that he sent to funding agencies for grants, and to banks for loans. LRB was partially successful in this quest but he decided to postpone plans for a year and decided, instead, to join IIM, Ahmedabad and make fresh applications in 1972. A key motivation for doing so was that the Ford Foundation, in partnership with IIM, Ahmedbad had instituted a programme whereby faculty at the institute were funded for their PhDs in exchange for them signing a bond that required them to return and teach at IIM, Ahmedabad for 5 years after they finished. However, Prof. Ravi Matthai, the Director of IIMA insisted that LRB spend a year working at IIMA before he went for his PhD. Eventually, LRB decided to quit HLL in December 1971, and joined IIMA from January 1972. He reapplied to Wharton and made a fresh application to Columbia University. With both offers in hand, he eventually decided to go to Columbia in the fall of 1972.